Looking for a place to rent during your Spanish studies? Roundhouses or Suites at Isla Verde: one bedroom open plan living/dining/cooking area in the heart of Boquete, surrounded by gorgeous gardens. 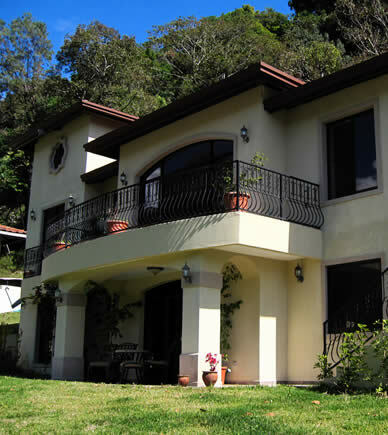 Valle Escondido's Vacation Villas & Condos: 2 - 4 bedroom vacation rentals + access to the resort's facilities. Websites with lists of places to rent in Boquete: links to local newspapers, forums, bulletin boards and classified ads with listings of rentals in Boquete. Real Estate Agents: contact an agent and let them help you find a house or apartment rental in Boquete. At Valle Escondido there are two bedroom condominiums and three bedroom villas available for rent, for both short and long term rentals. Please Contact Us for availability. Imagine six cozy roundhouse cabins with an architecture based on an ancient Indian design plus six contemporary and fetching suites, modern apartments, in addition to to a little casita, in the middle of a perfectly kept lush tropical garden with beautiful rainforest flowers and a sparkling mountain stream surrounding the whole... look no further: in Boquete you can find this magical place: it is called Isla Verde (Green Island) and it is a favorite amongst Habla Ya students. 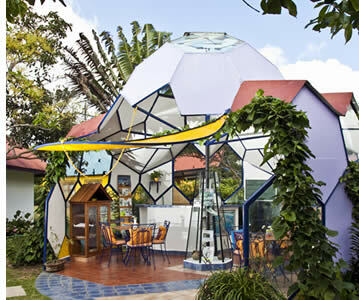 The roundhouse cabins of this bed & breakfast are set up throughout Isla Verde's lovely garden resembling a small and intimate village in the middle of which lies and open air geodesic dome eating area (breakfast menu is ample, although it is not included in room rates). Half of the roundhouse cabins can accommodate four guests each and the rest up to six. The large roundhouses have an open plan living area with a queen size bed and a comfortable sleepers sofa on the ground floor, and a double sized bed on the loft. The small roundhouses are also setup with an open plan design and have a double sized bed on the ground floor with two additional single beds in the loft. Each roundhouse has full kitchen, ample private bathrooms with hot showers and dining area. Wireless internet connection is also available. The lofts are generally suitable for young adults or teenagers. The suites are the perfect choice for couples as they can accommodate up to two persons with plenty of comfort (if you're single, they're fantastic as well). 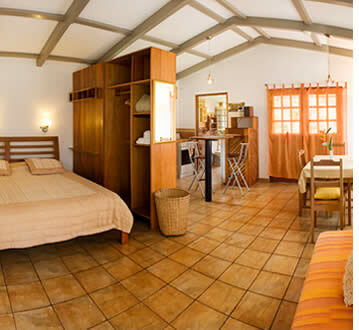 Each suite has a bedroom, an independent living area, an ample private bathroom and kitchenette. The upper floor units have a king size bed and a balcony with precious forest and river views. The ground level suites have a queen size bed and a step out of them will lead you directly into the lush of the tropical garden overlooking the crystal clear stream that runs just a couple of meters away and soothes your senses all day long. It is especially relaxing to fall asleep listening to the gentle currents of these streams. If you're staying for several weeks you'll simply love the suites as they have everything you need and you can't beat the surrounding gardens and stream. Two brand new second floor apartments are also available for mid term vacation rentals. 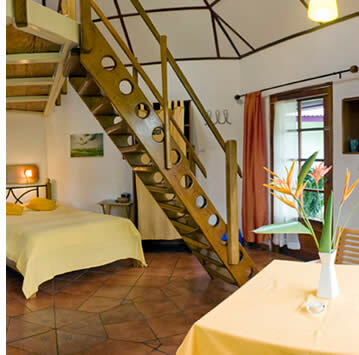 Colibri, which is the smaller of the two, has a king sized bed in a separate bedroom, and a living room with a kitchenette, a sofa, a TV and bathroom with hot shower and a balcony. The Quetzal apartment is equipped just like Colibri, but is a lot larger. As if it wasn't enough, Isla Verde also has a separate little house for rent, called Casita Gámez, with a loft upstairs with a full bed, and a living area downstairs with a sofa, a kitchenette, a separate bath with hot showers and a small private terrace. 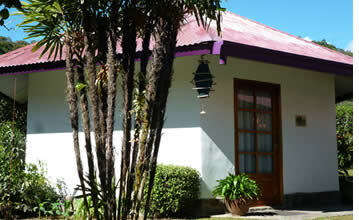 The casita is small, and ideal for couples or single travelers. In addition, on site massage therapy by Isla Verde Massage and Beauty Center, body work and facial services are available for guests at the Yellow House (Casita Amarilla) located on the Isla Verde premises. The Mango Restaurant, with a fresh perspective to Panama cuisine is the perfect compliment to your stay at Isla Verde. Due to the serene and tranquil nature of our tropical paradise, if you plan to bring your children under the age of 10, please talk to us for prior approval before making your reservation. Infants and supervised children over the age of 10 are happily welcome and will certainly fall in love the outdoors. Isla Verde in general is an excellent choice for those seeking peace and leafy surroundings, but with the convenience of being within walking distance to town. A clear favorite among our students, Isla Verde holds a privileged place in our list of mid range hotels. The staff will definitely go the extra mile to make your stay an unforgettable experience and with their personalized service there is always someone around to help you with your needs. At Isla Verde you'll surely relax and nourish your soul by opening your senses to the serene and tranquil nature of the tropical paradise. If soft, safe and cozy is your style you'll certainly not be disappointed and we guarantee that you'll not want to leave. For over 10 years hundreds of Habla Ya students have made Isla Verde their home while in Boquete. Please click here to make a reservation at Isla Verde Roundhouses & Suites in Boquete, Panama. 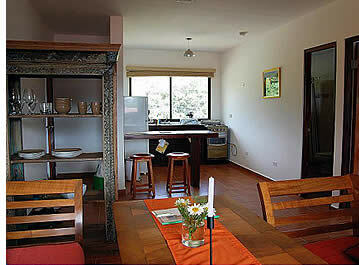 At Valle Escondido Resort, Golf & Spa there are several vacation villas and condominiums for rent. 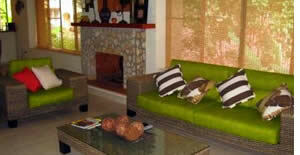 You'll be able to find 2 - 5 bedroom vacation rentals completely furnished and exquisitely decorated. The vacation villas and condos are very ample indeed and have gorgeous terraces and living areas to take advantage of the resort's stunning surroundings. During your stay you'll also be able to enjoy access to all of the resort's amenities such as indoor and outdoor swimming pools, tennis and racquetball courts, a 9 hole golf course, full service spa with steam baths, fantastic restaurants and much more. Click here to learn more about the resort. If you would like to receive photos and descriptions about specific properties please contact us letting us know how many bedrooms you need, the length of your stay and your dates. Prices are in US Dollars. 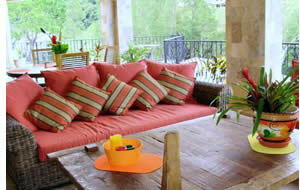 Daily or weekly cleaning service can also be included in your villa rental. Valle Escondido Resort, Golf & Spa leads our list of vacation rentals in Boquete because of all of the additional benefits that you get from staying there. What a better way to compliment your Spanish course then by playing golf or heading to the Spa after your Spanish lessons or taking a swim at the Country Club's pool. At Valle Escondido you can enjoy a wonderful meal, keep yourself fit at a first class gym or just relax at the Sauna. Believe us: this will be a Language Travel Holiday in Panama that you'll never forget! Go ahead and make your reservation today by clicking here. As they say: come for a weekend, come for a month, come to stay. 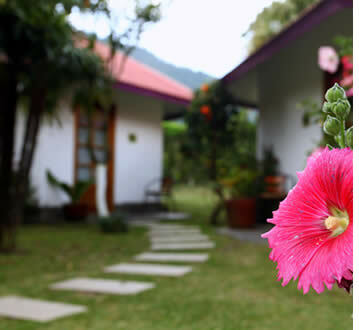 When you're looking for a house to rent in Boquete for more than a month, the best way to do it in our opinion is to come, stay at a midrange hotel for a couple of weeks and look for yourself, because this will be the only way in which you'll be sure to find something that you really want. If you plan to rent for only a month, you're better off staying at one of the properties featured above on this page, Isla Verde or at Boquete Garden Inn. Most of the time, real estate agents will not have a lot of options on their hands if you're not willing to spend more than $1,000 per month. If you're looking forward to spending less, around $300 - $800 per month, the best you can do it in our opinion is to post on the following sites exactly what you're looking for and then you'll get answers with specific houses or apartments that are available for rent. Most people find their house driving around Boquete, because a lot of places aren't posted on internet sites or with real estate agents. Finding the perfect place to rent without previously visiting the area can prove to be a difficult task. If you're looking for a long term rental you may benefit from exploring the area for at least 1 month before you commit to rent a place. This will allow you to see for yourself what options are available in the different areas of town and you'll probably get a better deal in this way. Checkout our list of the best hotels in Boquete where you'll be able to find the perfect place to stay at that will also suit your budget, and from where you'll be able to set up your base of operations for that first month in Boquete. The above are Real Estate Agencies that are known to have offices in Boquete. We hold no responsibility whatsoever for the business conducted between individuals and any company or individual related to Real Estate. Habla Ya Language Center is only a language school and provides this list of real estate agencies as a helpful tool for those students looking for a property to rent or to buy in Boquete, and therefore any situation that results as a consequence from using this list is your own responsibility. Looking for a place to rent in Boquete? We'll be more than happy to help! Contact us! Boquete, the perfect destination for an adventurous vacation! 10. World class restaurants. and last but not least, Boquete is home to the best coffee in the world! Learn more about Boquete. The cost of living in the Panama economy depends, as it does anywhere else, on lifestyle.